Established in 1805, Pictet is an independent wealth and asset management group based in Geneva. It attracts global financial institutions and private clients with high net worth. We designed and developed a retirement planning tool on the iOS platform. Communicating a luxurious and rich brand experience, the app is aimed at servicing existing clients, as well as giving the Pictet Wealth Management consultants a beautifully executed sales tool to use in client planning meetings. 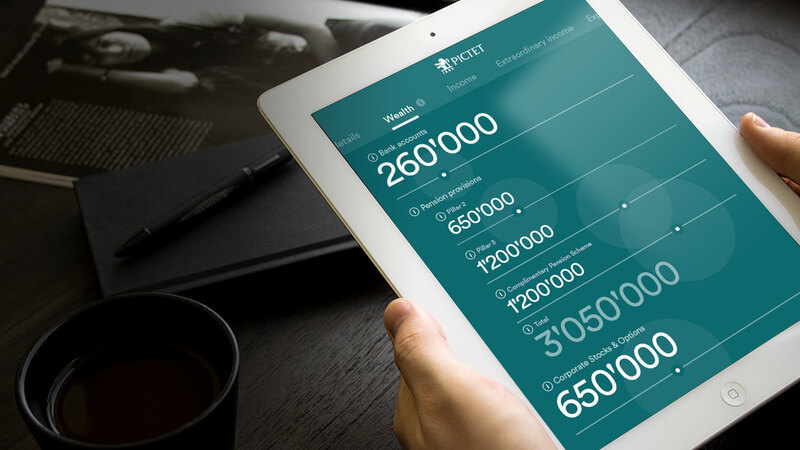 The Pictet retirement planning app takes a set of financial data provided by the user in a series of input screens, and visualises an outcome in the form of an easy-to-understand graph. Users are then able to alter various parameters to discover an optimum investment input to retire comfortably on. It also facilitates further conversations with Pictet's representatives.